Most bucket lists include pursuits like skydiving, seeing the Northern Lights, or running with the bulls in Pamplona. But Tony Strasiser just wanted to steal something from Target. The 23-year-old Pennsylvania native was arrested yesterday after trying to boost bed sheets and Clif bars from a Target in Clearwater, Florida, according to an arrest affidavit. Strasiser, cops say, hid the merch in a reusable grocery bag and departed the store. But when he was subsequently confronted by a loss prevention officer, Strasiser dropped the stolen goods at the store’s entrance and fled on foot. Charged with theft, Strasiser was booked into the county jail yesterday afternoon on the misdemeanor count. He was released around 11 PM after posting $250 bond. 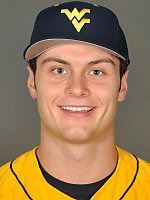 The 6’ 6” Strasiser was a high school football and baseball star who attended West Virginia University, where he played on the school’s baseball team in 2015. Strasiser, a biology major, graduated last year from WVU. Strasirer’s mother Lisa is the district attorney in Somerset County, Pennsylvania.